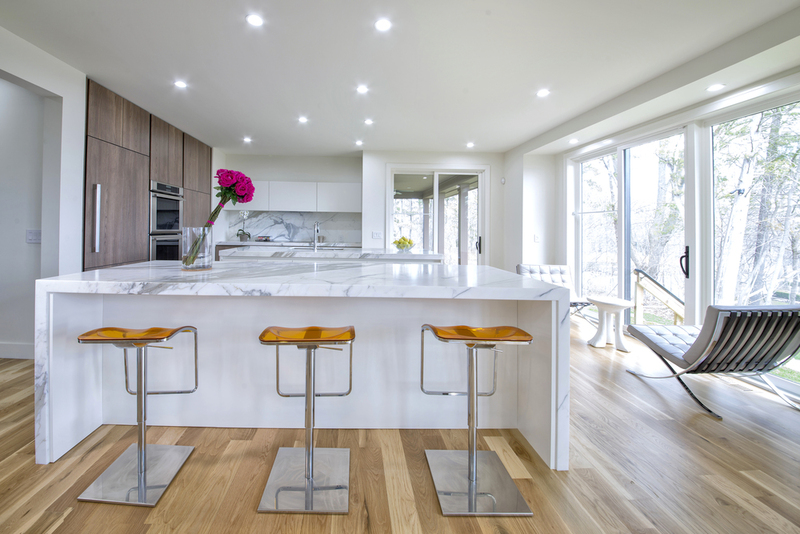 Serendipity may have stepped in when Anna and Seth Rogers were about to design their kitchen in their new construction home in Bloomfield Hills, Michigan. As Elaine Lewenz, a designer at EuroAmerica Design, lives on the same cul-de-sac as the couple, it was only natural that they work with her at the EuroAmerica Design showroom in Troy. With excitement to create a unique space for their young family, the Rogers decided to incorporate two cabinet styles and two islands for both functionality and an interesting design aesthetic. One of the double islands houses a wine cooler and ice maker, the other has a sink and a microwave, which allows for convenience and for a minimalistic look. “EuroAmerica Design offers the latest products and has the flexibility to think outside of the box,” said Anna.